Courtesy Kevin Collins/Creative Commons License. Inspired to visit Yosemite, perhaps after watching the Ken Burns film, The National Parks: America’s Best Idea? Don’t drive the minivan. Bad idea. The SUV also might be a little risky. 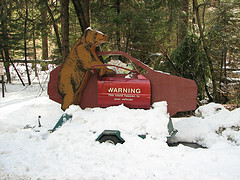 So say researchers who analyzed seven years of data on the vehicles broken into by black bears in Yosemite Valley. In a sizeable advance in body fat research, three independent teams have identified a surprising energy-burning organ in healthy adults: brown fat. Splayed beneath collarbones and tucked under neck muscles, brown fat appears more active and plentiful in leaner bodies, but may be present in most people, the studies suggest. Whoooooosh! That rushing sound you hear could be the plummeting cost of genome scans, the surge in studies linking common genetic markers to widespread human diseases and traits, or the murmurs of people discussing what those genetic markers portend for their personal health risks. But it is still early days, say the Harvard researchers who helped bring about this convergence of science, technology and popular interest in personal genomics. These researchers are scrambling to bridge the knowledge gap between the reality and the expectations for predicting diseases using high-tech genomics technologies. Donald Coen, professor of biological chemistry and molecular pharmacology at Harvard Medical School (HMS) in Boston, may be able to save a skilled research job and restore another in his lab. Isaac Kohane, co-director of the HMS Center for Biomedical Informatics, hopes to hire and train new bioinformatics staff. Peter Sorger, HMS professor of systems biology, wants to buy a powerful data storage system from a U.S. company to share with his colleagues. There are many ways to die, but most people’s last breath will come when festering plaque in a clogged artery ruptures and triggers a heart attack. Scientists suspect obesity and its molecular sidekick inflammation to be key villains in this scenario and in five of the other six leading causes of death in this country, including stroke, cancer, and type 2 diabetes.